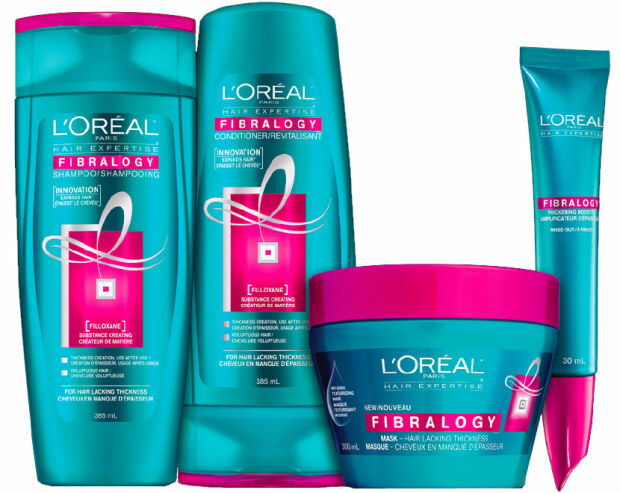 Big things are hapening to thin hair with L'Oréal Fibralogy! Limp hair that lacks volume and firmness is going to love L'Oréal Fibralogy - a new haircare line that plumps up the volume of hair from within the hair fiber an adds substance - thanks to a wonder ingredient Filoxane - that deeply penetrates the hair fiber and expands it adding volume and body, every time you wash.
Shampoo & Conditioner - 385ml - $5.99 - creates thickness that you can feel ever after just one use with the added benefits of effective cleaning and body building in the shampoo and softening and untangling in the condition. Thickening Booster - 30ml - $7.49 - contains a high concentration of Filloxane to infuse hair with unbelievable volume, body and bounce in-between washes or with your shampoo and conditioner..
Intense Texturizing Mask - 300ml - $7.49 - with a lightweight, jelly-like formula that instantly restores mass and body to thin hair. Enriched with a dry oil, restricting ceramide and candelilla wax to treat the fiber without softening it leaving a long-lasting feeling of cleanliness and thickness to hair. The line is available now at drug, mass and grocery retailers across Canada.